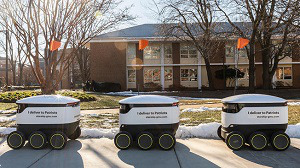 George Mason University students can now have select food and drinks orders delivered to them by robots, thanks to a new partnership with European startup company Starship Technologies. Starship will bring at least 25 six-wheeled robots to the Fairfax campus. Students can use the robot delivery service for orders from Blaze Plaza, Starbucks and Dunkin’ once the service begins, and more will be added in the following weeks. Starship’s delivery robots can transport a maximum of 20 pounds of goods, and have been previous tested in several cities worldwide over the last few years, usually in partnership with food delivery services such as DoorDash or Postmates, according to The Verge. The robots can drive themselves over curbs, on sidewalks and are able to operate in rain or snow and at night, and can navigate around objects and people with the help of exterior cameras, according to Starship’s website. George Mason students can order food through the Starship – Deliveries app, available on both Android and iOS. Students can drop a pin on the map to notify the delivery robot where on campus to go, and can track the order throughout the trip. The robots also have a lockable lid that can only be unlocked by the individual who placed the order, so their order is protected from the possibility of it being stolen. Each trip is monitored by Starship employees.